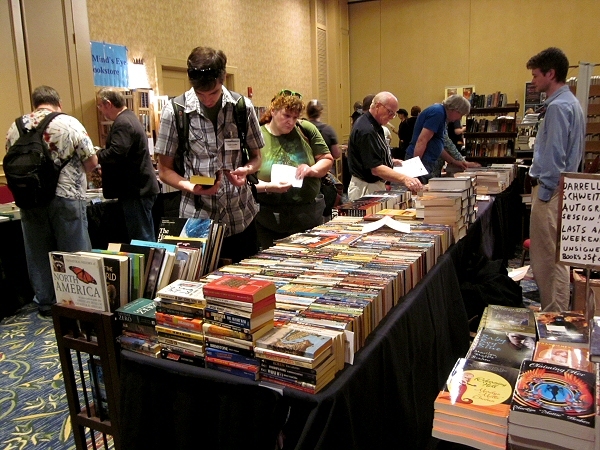 Check out the opening rush at the booksellers room at Readercon–You can see how seriously people still take books here. David Hartwell is back there behind several customers. 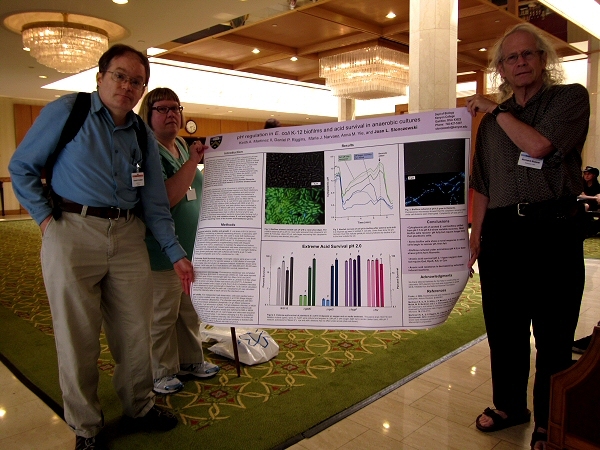 And there was serious interest in my students’ poster, actually intended for the Gordon Conference this week. 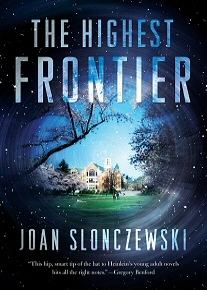 “Real science” at Readercon–people were thrilled. 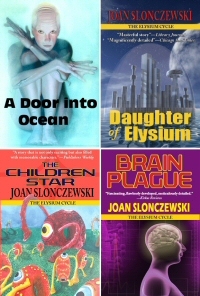 At Readercon we had a great panel on “human hybrids” in science fiction and in human history. In human history, Homo sapiens did hybridize with other human “species,” the Neanderthals and the Denisovans, who may have restored key aspects of immune diversity that the rapidly attenuating Homo travelers discarded along their east-ward trek. But all those “species” were humans anyway, descended from a common stock. More speculatively, are human-alien hybrids possible? In literature what if they look too much like race hybrids? Are aliens more than a stand-in for race? Octavia Butler’s Xenogenesis does a really good job of the biology aspect of human-alien hybridization, and why the aliens do it. (The aliens engineer themselves to perfection, that is, clonality, and must obtain new gene sequences to adapt.) But the story, about what the aliens do and why, gets really icky. You cannot avoid a racial subtext; that the aliens force “choices” on humans, similar to the “choices” forced on slaves by their owners. The audience members said they prefer stories that show different races and cultures as part of normality, as individuals defined by something else; more like the diversity of Brain Plague. But Brain Plague has human-ape, human-machine and human-microbe relations. The panel ended before we fully got into that. In my experience, though, individuals who combine two very different kinds of genetic or cultural heritage often do show a special, unique synthesis that is greater than the sum of the parts. And in science fiction, we see the same; for instance, Spock is the most memorable Star Trek character because his dual heritage makes him complex, more than two-dimensional. What do you think? I’d personally recommend Charles Mann’s 1493. He has a lot of fun with the racial parts of the Columbian Interchange, caused by Europeans (and then Asians) colonized the western hemisphere. In other words, this goes through all the weird combinations of mulattos, octaroons, and so forth, to today’s Hispanics. This is a lovely problem for racial theorists, because hispanics are a”race” or “ethnicity” defined entirely by being the product of an intense genetic interchange from multiple races. It’s also interesting by how much prejudice was institutionalized around things like skin color and closeness to the conquerers, everywhere in the Americas. These institutions are breaking down, slowly and painfully, but they still color history and attitudes. It takes some sensitivity to acknowledge this history, and simultaneously to reach out to people who are different with respect and not fear..
We should also consider the flip issue: how often does “multi-racial” mean that everyone should want to be, or at least act, like a middle-class white Americans? Isn’t that a form of prejudice in itself? What makes Spock multi-dimensional is the fact that (most of) the writers were good enough to show the inner conflicts arising from the dual racial heritage. Data in ST:TNG (and to some extent Worf and Jordi) managed the same trick of showing how and why they were conflicted. On the other point, having science programme streams at SF cons tends to play well generally IME.